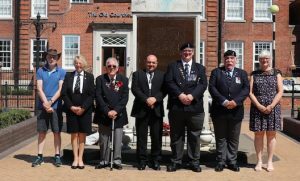 A pair of Silent Soldiers will stand guard at Grays War Memorial from Monday to mark the Centenary of the final year of the First World War. Two stunning silhouettes of WW1 Tommies were unveiled on Armed Forces Day, Monday 25 June. 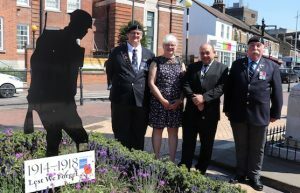 Work will also take place at war memorials across the borough as Thurrock prepares to mark the centenary of the end of World War One in November. 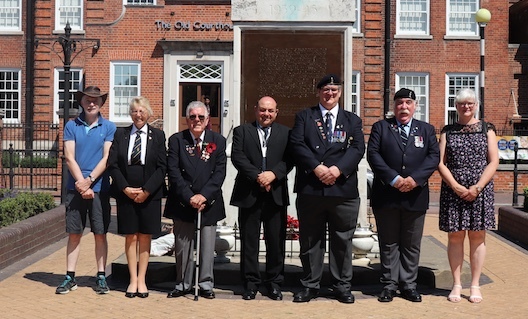 Cllr Gary Collins, Portfolio Holder for Central Services, said: “The silent soldiers are a reminder of the bravery of all who served in the First World War and a chance for Thurrock Council to support the good work of the Royal British Legion and the Poppy Appeal. Rod Oakley, Chairman of the Grays Thurrock Branch Royal British Legion, said: “These two silhouettes are a reminder of the sacrifices millions of ordinary people made during the First World War. One Response to "Silent Soldiers at Grays War Memorial"
All credit to those who have arranged this….I salute you!